Early photographs of Indians, too, are caught between two stories, the stories White photographers wanted to tell, usually dictated by the markets they made their photographs for, and the subject’s own story. Sometimes the distance is too great and it is difficult to capture the true voice of the past. 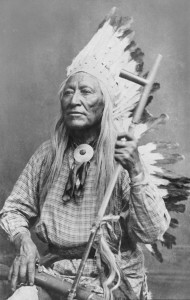 This second photo by Jackson is similar to the first in that it shows Chief Washakie, not as Whites would expect him to appear in his role as Chief of the Shoshones but rather as a working member of this tribe or community. The real birth of interest in specifically Indian subjects and photography started when Jackson came to Omaha, at a time when the city was the hub of activity in the west like Denver is today. 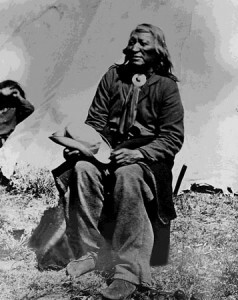 In Omaha, Jackson opened up a studio and began venturing out to surrounding reservations, a practice he continued after linking up with Hayden. This picture, by Baker and Johnson, photographers based out of Evanston, Wyoming, is a studio portrait done at Fort Washakie. (The painted curtain stops short of the frame on the right hand side revealing the brick work of one of the Fort buildings.) Here, the photographer has posed Washakie in manner befitting White society’s concept of what a tribal leader should look like, a way that accorded with Baker and Johnson’s perception both of Washakie’s position and their personal impression of him. Baker and Johnson did a number of portraits at Wind River that were really designed for the White market. The practice of recording trappings of wealth or prestige in a photograph, (represented, for example, by warbonnets or ceremonial objects of Native American cultures), or of presenting the subject in such a way that their social position was made apparent, was originally an Anglo custom. Early photos—showing people in every day dress or every day life are harder to come by. 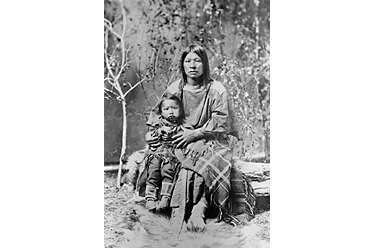 Baker and Johnson’s handsome studio portrait of a Shoshone women and her daughter in traditional dress is also typical of the kind of photography done by professionals who had a specific market to cater to and a specific story to tell. 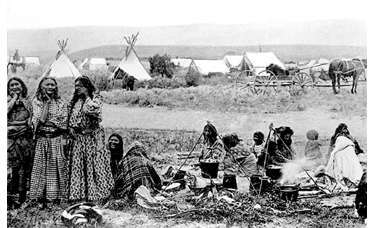 Often such stories only briefly touched on what the Shoshone people were really experiencing at that time. While Chittim’s photographs help document a culture in transition, they are not part of a systematic attempt to record or preserve. 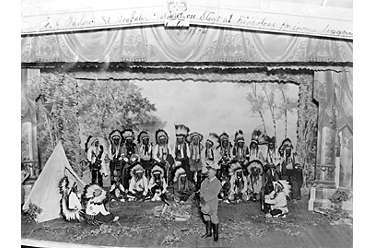 A number of these photographs, however, provide an invaluable testimony to the strong cultural continuity maintained during the early reservation years when dances and ceremonies were still practiced without government interference. 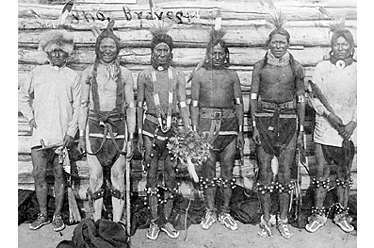 Here, participants in a Wolf or War Dance line up in front of a log structure, to have their photograph taken. Several seem amused at the whole proceedings. The Wolf Dance costume is one of the prettiest worn by the Shoshones. They wear beaded vests, neck pieces and gloves. Their headdress is made of porcupine quills and feathers. Fastened to the back of their belts is a big bustle of feathers….At this dance many of the little boys had Christmas tree decorations and sleigh bells on their costumes. Long ago they wore shells to make a noise. The costume can be just what the dancers or his parents want. 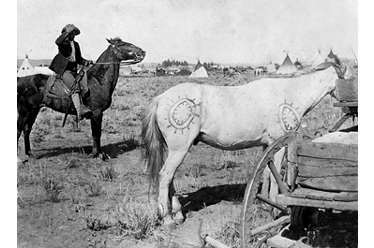 According to Starr Weed, this horse, painted with a sunburst symbol, was probably used in the sham battle. 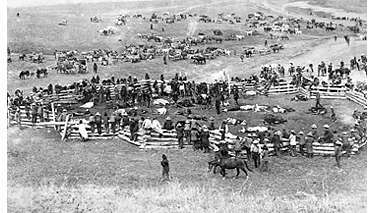 Mr. Weed recalls that after the battle, horses and riders paraded through the camps pitched outside the dance grounds. 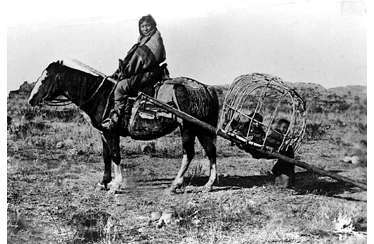 Here, tied to a wagon, itself a symbol of changing reservation life, this horse can be seen as a transitional figure, evidence of the old life continuing amidst changing times. 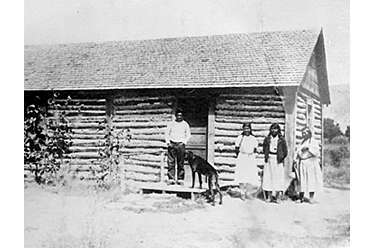 Wind River Agency, a center of reservation activity, was established in as a residential and office headquarters for government personnel. 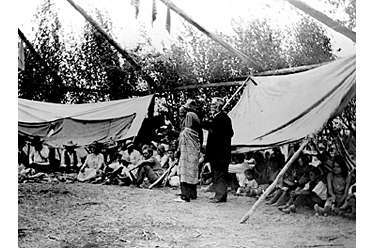 The Indian agent, who took census every year, was in charge of distributing government annuities provided for in the Fort Bridger Treaty. 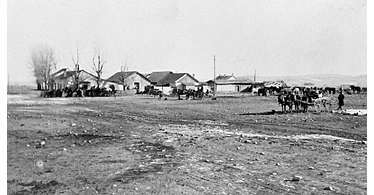 The Agency’s location, on what is now the Trout Creek Road, was a natural choice. The area around Trout Creek and the Little Wind was close to the mountains and with a relatively warm climate had already served as a preferred camping area in former times. When Fort Washakie was abandoned by the military in 1909, the Agency moved from Wind River to the Fort. Agency headquarters were then established in the stone building, known as BIA Building #1, which now houses staff for several tribal programs. Originally, it had served as the soldiers’ library and gymnasium. 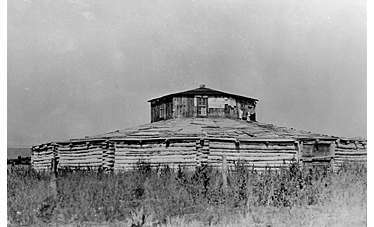 J. K. Moore’s trading post at Fort Washakie, located where the present Fort Washakie post office now stands, like the Agency, was a central meeting place. 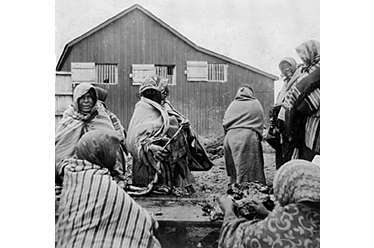 Women brought their beadwork there to sell or exchange for a few groceries, it served as a gathering point for Whites and Indians alike. 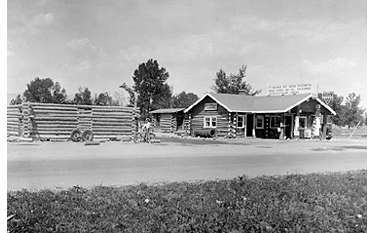 The importance of the trading post as a center of reservation life is reflected in the fact that it was used as a backdrop for many photos of reservation residents. 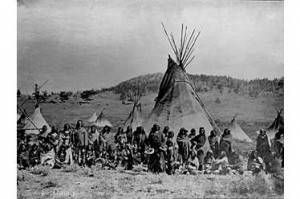 When President Grover Cleveland visited the reservation in 1883, his photographer used it to pose Washakie (right, on horseback) and a group of Shoshones. Two Shoshones, Enga Barrie and Charles Lajoe, assisted the Rev. 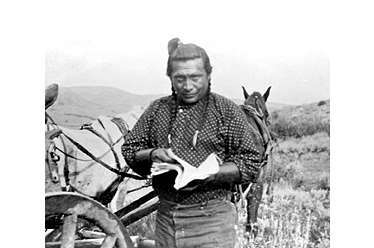 John Roberts in the work of translating a part of the Book of Common Prayer and a Catechism from English into the Shoshone language. Charles had been one of Mr. Roberts’ pupils from 1883 to 1890. 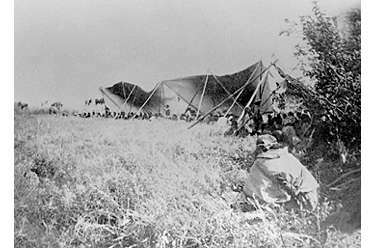 According to most sources, the first tribal council was convened in 1901, a year after Washakie’s death. 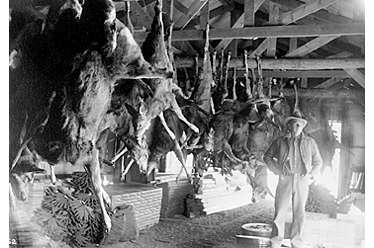 The transition from hunting and the time-honored ways of living off the land began to change. But the change did not come easily. 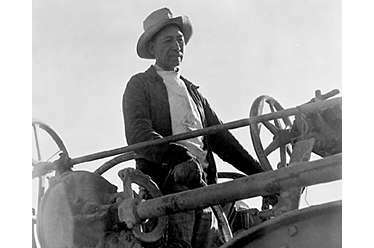 Later, community effort and helpful neighbors combined with farming skills to help people through the difficult years of the Depression. Vocational skills which could be put to immediate use were taught at the Fort Washakie Government School. Boys also learned farming and carpentry, they learned to put in windbreaks and ditches, activities which were often part of CCC or WPA efforts. Government services became critical during the Depression. 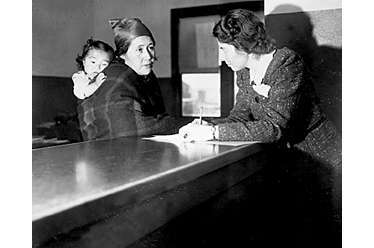 Visits the Wind River Agency for help with food, health care, or shelter were frequent. 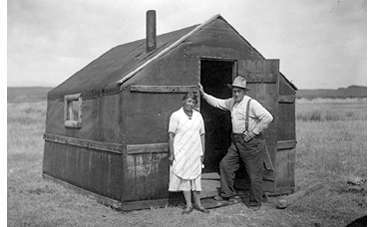 Despite the economic hardships of the Depression, many were able to better their living conditions working on their own and with the help of government relief programs. Suzette Wagon recalls working for the WPA “in 1938 or 1939 for a $1.00—a day. 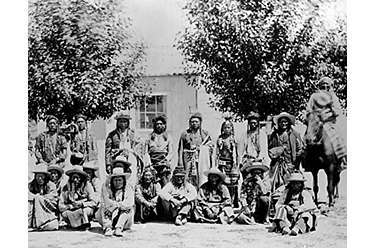 That was $18 every two weeks.” And Ina Weed remembered “working in the agency washing windows for fifty cents a day.” Later, things took a turn for the better when the Tunison money finally came, and Shoshones were finally compensated for the loss of part of their reservation to the Arapahos in 1878. Many, like Angeline Wagon recalled her parents’ buying their first house in 1942 with Tunison money. In 1922, 500 Shoshone, Bannock and Arapaho traveled to Milford, Utah to film the western epic, “Covered Wagon.” Actors on the Utah set could earn up to $87.50 per week if the whole family, plus horses and teepees were involved—more than most made on the reservation in a year. Later many performed living prologues for showings, locally, as well as in Hollywood and England. In this photo, E.J. Farlow of Lander introduces Indians performing a live prologue at the Acme Theater in Riverton. Movies which portrayed Indian life caught the popular imagination and sometimes provided opportunities where cultural and economic survival came together. The concern for authenticity reflected in MGM’s use of real Indians for “Covered Wagon” was unusual for its time. Although this movie industry which grew out of this film and centered around Wind River in The 20s and 30s helped create a demand for artifacts, costumes and skills from the pre-reservation ear, in addition to much needed jobs. 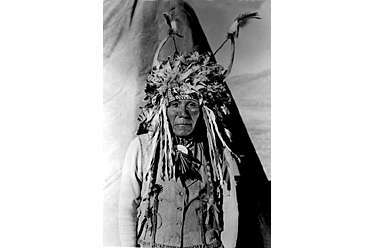 Between 1926 and 1929, MGM made 16 films using Shoshone and Arapaho from Wind River. 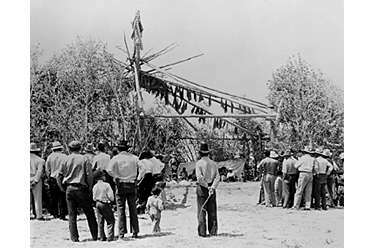 Many were filmed on the reservation or included footage shot there. “The End of the Trail,” for which Mojo Tidzump was photographed, was influenced by both the changing atmosphere of the Collier administration and leading actor, Tim McCoy. In the film, McCoy made an impassioned plea for Indians and their rights. 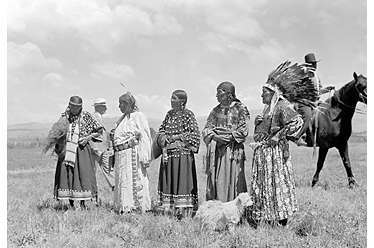 In the 1930’s, cultural practices, long suppressed by government and education policy, were encouraged and strengthened under the administration of the new Commissioner of Indian Affairs, John Collier. 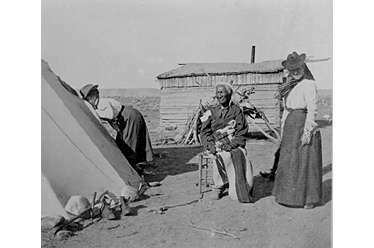 In the early days people would come to the tribal Council House by horse and wagon to camp out for several weeks at Christmas time. The council house was a central location where all gathered to dance and celebrate the holidays and other special occasions. As more were able to afford automobiles, fewer camped out. But the Council House remained an important community and cultural center. Many White people criticize or make light of this dance but it is because they do not understand the great Ta-go-wudit or thirst endurance dance. 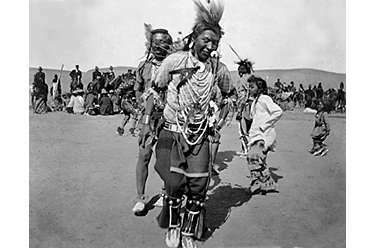 They do not understand the mysteries of the Sun Dance, The center pole, or altar, the buffalo head, the eagle, the west forked pole on which the eagle sits….It is hoped that many White people will attend this ceremony…and witness for themselves what stamina and fortitude the Indian must have to participate in this dance. 39. 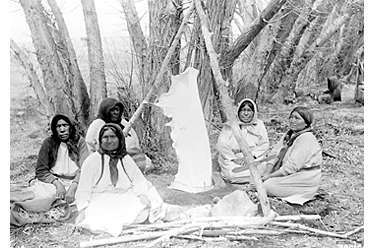 Shoshone women tanning hides, ca. 1930s (BIA, Wind River Agency). 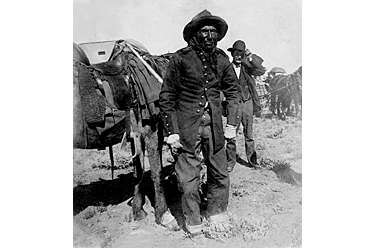 Selling bead work to tourists and smoked buckskin gloves to the Dubois Tie-hacks that didn’t shrink when wet was an important part of many families’ incomes. During the Depression there were also government sponsored tanning projects. 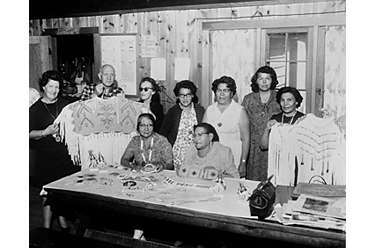 One, which was held at the Government school where this photo was probably taken, helped produce traditional buckskin clothing for the school’s costume class. Parades and other public celebrations also provided a showcase for traditional skills and craftwork. Traditional crafts and beadwork were an important area where cultural economic survival came together. 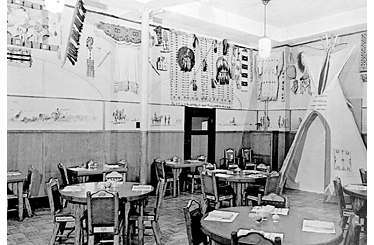 Lander’s Nobel Hotel, a mecca for tourists, was a renowned showcase for reservation crafts. In Dubois, traveling traders would make routine visits to dude ranches, some as isolated as the T-Cross, clear at the head of Horse Creek in the Absoraka Range. Attitudes about the presence of visitors or possible income-producing projects like tribal museums have undergone a number of changes. As reservation life became more settled and accessible, an ever-encroaching world found Indian culture more readily available and fascinating. Anthropologists, tourists and sometimes simply the curious became increasingly common features around Wind River. 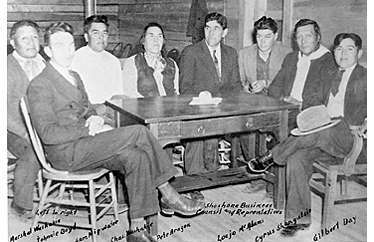 Dr. Grace Raymond Hebard, head of the department of Political Economy and Sociology at the University of Wyoming, was a frequent visitor at Wind River in the 20s and 30s. Her book entitled, Washakie, An Account of Indian Resistance of the Covered Wagon and Union Pacific Railroad Invasions of Their Territory, published in 1930 and currently out of print, became a classic. Dr. Hebard’s material—especially on Washakie and Sacajawea, widely circulated and quoted—served to bring a number of visitors and researchers to an area once noted primarily for being the most desolate and isolated military post in the country. 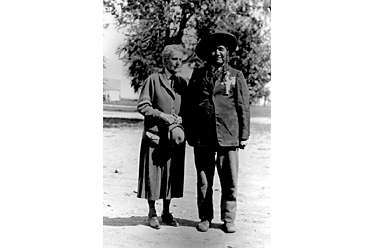 Because Hebard did not always document her work or acknowledge her sources, her version of Shoshone history and the interest it aroused among outsiders have caused mixed feelings through the years. Excavations of a large cave at the head of Dinwoody were a case in point where activities by outside researchers and fossil hunters caused problems resulting in bad feelings which linger today. 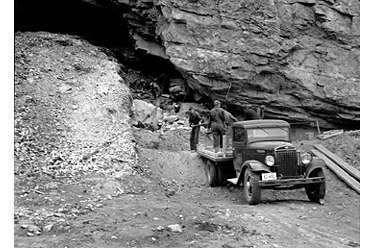 According to Lou Meeks who ranched in the Dinwoody area at that time, council members gave permission for researchers to examine the cave but not to remove any artifacts. A rock wall inside the cave was, however, torn down and many items taken. The Council then gave permission for these to be stored temporarily in a “museum in Casper” with the understanding that they later to be returned to the tribe when it had a museum facility of its own. 47. & 48. “The Indian Mode of Transportation,” ca. 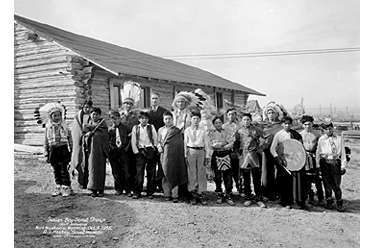 1920s and 1930s (St. Michael’s Mission, Wind River Archives, Central Wyoming College. 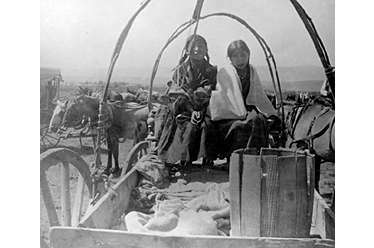 Around Fort Washakie, young girls in a wagon were an everyday sight well after the advent of the automobile. Yet, at a Lander Parade, an Indian wagon was already an object of curiosity. 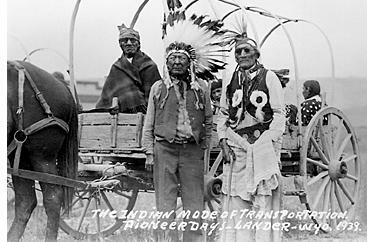 Lander’s Fourth of July celebrations and Cheyenne Frontier Days were two events that drew many reservation participants and gave outsiders a glimpse of both past and present. With the development of the tribe’s oil resources, came new encroachments on Indian lands. 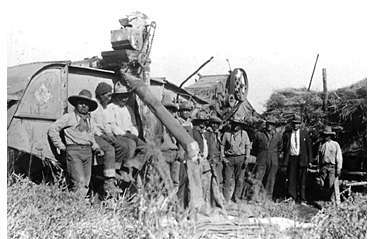 But oil also brought income, and more people were able to purchase cars—a factor which dramatically changed many aspects of reservation life. 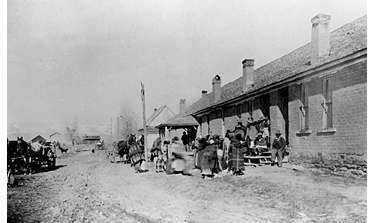 With automobiles and increased transportation, reservation boarding schools were either transformed into day schools or closed as times changed and students had the option of attending school in town. The Government School changed to a day school in the mid-1930s and became a public school in the mid-50s. It ceased to be a self-supporting school shortly before then, selling off the last few of its dairy and beef herd under pressure from local ranchers who resented what they had come to view as government competition in the market place. 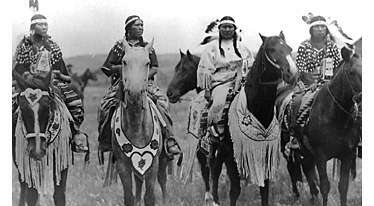 While traditional groups like the Young Wolf Dancers received support during the Collier years, new youth groups such as the Boy Scouts or the Government School’s Drum and Bugle corps also began to emerge which extended activities and opportunities outside the reservation. The military provided many with job opportunities and a chance to travel beyond the reservation boundaries. 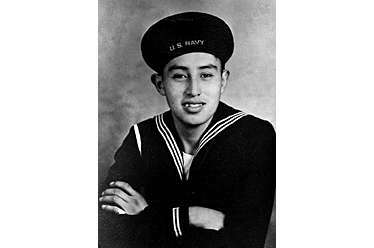 A large number of those interviewed recalled being well-prepared for their time in the service thanks to training in drill work they received at the reservation boarding schools. 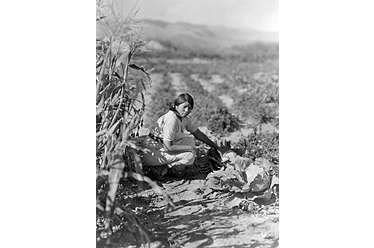 While changes resulting from the reservation system brought many new factors into play, cultural continuity and adaptations remain in evidence in many aspects of Shoshone community life. Here, a draped and decorated car replaces the horse in a Shoshone parade.